Bring your Cardinals questions and comments, and talk to Post-Dispatch baseball writer Derrick Goold in a live chat from spring training at 1 p.m. Monday..
Greetings from Roger Dean Stadium where the Cardinals are hosting the Harper-less Phillies, and both teams already have hits. So that's out of the way. Already a busy day of news in Jupiter. Cecil out for opening day, Jedd Gyorko increasingly questionable for opening day, and as I type this Dakota Hudson is make his last bid to hold onto the fifth spot in the rotation that he has won this spring. There's the ongoing offensive issues. There are bullpen questions. And, there is plenty of time in this chat for me to promote The Post-Dispatch's 2019 Major League Baseball Season Preview, which hits newsstands and front porches this coming Sunday. Set aside a few cups of coffee to wade into that annual special section. Enough prelude. We've got a few things to talk about. So why not start early? Tell your friends. Spring Training results don't really matter--but are there any results in this mix that we should be worried about? The lack of walks is something to keep an eye on. The amount of flyouts is also interesting. On the one side there does seem to be a clear interest from the hitters in making contact, even to the extreme level of not taking walks. They have faced strike-throwers often down here this spring. On the other side there is all the fly balls -- which speaks to the desired angle of hitting and the enormous ballpark. This has not been a great place to hit this spring. Look around to the other teams with low slugging percentages -- Boston, Houston, all in Floriday, and Miami, the Cardinals' roommate for March. What stands out to me is the lack of walks and more than 200 strikeouts. Or, on an individual level the timing that Marcell Ozuna and Harrison Bader still seem to be searching for. Matt Carpenter doesn't have many hits -- he does have three homers -- but he hasn't appeared to be off with his timing. Others have. Tyler O'Neill hits a 2-0 pitch for his fifth homer of spring, on cue. With Gyrko not ready for opening day, does this mean that both Munoz and Robinson make the team? It would mean that, yep. Absolutely. Derrick, I know it's spring training but the offense worries me. Talk me off of the ledge. Not sure I can do that. Shildt had some comments in the story linked to above that may help you there, but the stats are what they are. I will say that some of the players have looked far better than their numbers and others have looked worse than their numbers. Sometimes it's like the box scores are watching a different game. Thank you for these chats! The subscription to STLtoday.com has been a great investment! Last year the outfield was touted as maybe the best in the division. It obviously didn’t turn out that way, but this year the outfield may be a problem offensively. All the starting outfielders are having terrible springs, and the replacements like Martinez (defense) and O’Neil (SO’S) have their own issues. Could the outfield be a cause for concern for this offense going into the season? There's a lot to unpack here. First, thanks for being a subscriber. Much appreciated. We all know that we have to respond to your investment with the coverage you expect -- and improving the coverage all the time. Second, I try to avoid back-and-forths with other writers, except maybe on Twitter (right? ), and want to be respectful of the opinions presented and defended there. I don't agree with the premise that this spring hasn't gone well for Dexter Fowler. We must be watching different springs. His batting average is low, for sure. He hasn't taken a walk until recently. And doesn't that tell you something about what he's doing? He's swinging a lot. He's trying to show that he has the bat speed and the health and the things the Cardinals wondered about, and now he'll start taking those walks too. His average exit velocity this spring on hard-hit balls is above his high of the past season. He's move better at this point in right field than we saw him at any point this past year. These are all things that you can see watching the games -- and it's OK if you disagree with my view of this. Let me add, however, that I spoke to a scout who had the same view of Fowler's movements in the field and running, and how livelier it looked compared to last year when it appeared that he was playing on a planet with greater gravity. Now, the view of his swing changes depending on who you ask and when they saw him. He's had drives to left, right, and right-center in the past week that he just did not have last year. The Cardinals wanted to see Fowler play with health and authority. They've seen that. Third, that doesn't change the fact that, sure, a reckoning is coming with the Cardinals and their outfielders galore because spring stats don't carry over -- and all parties agree that starting strong is important for Fowler. So, I would argue those "screws" were already "tightened" because no matter what Fowler did in spring training he was going to be judged on what he does in the season. That is the commitment the team has made to him. So, I don't agree with the premise, and I'm sure now I'll get blowback for that. And the author or anyone else with that strong blog, Viva el Birdos as founded by the excellent Larry Borowsky, is welcome to enter the chat and take it up with me, or find me on Twitter. I'm available. Fourth, the outfield should have been the best in the division last year. It was not. Sagging performances from all three outfielders. This year there are concerns about the offense coming from the outfield, for sure, and that's important because it will determine the makeup. Harrison Bader starts in center as long as the corners are producing, and if they are not then a shakeup may be needed because as a group the Cardinals need a mix of power (Ozuna), OBP (Fowler), and speed (Bader) for the lineup so that the OPS can come from Carpenter and Goldschmidt and possibly DeJong to make a difference and have a lineup with depth. His candidness about the offense yesterday and willingness to confront, discuss any topic has been refreshing, absolutely. Derrick, can you shed light into the contract extension that awaits Paul Goldschmidt? We know that the Cards had some speculation on what an extension would take before the trade, but how confident are they in those terms? What is a realistic extension for Goldy's side, and if he does choose to go to market, what years and/or dollars push him out of the Cardinals comfort zone? I have reported that Arizona believes the Cardinals had some information/feeling about what it would take to sign Goldschmidt before they completed the trade. There has been nothing that I have learned since writing that to disprove that. The Cardinals have a good feel -- and the recent deals have only reinforced that. Conversation starts around five-years, $150m, and it fluctuates based on whether Goldschmidt wants a sixth year, wants this to be a sixth year in the deal and get a higher salary this year, or wants something different. At last check, there have been no talks about a contract. This is not unusual. The Cardinals have said they want to get Goldschmidt to St. Louis, get him into home games there, and give his family a chance to know what it's like to live there before they have these conversations. That hasn't happened yet. So, you're looking at a May, June timetable with maybe All-Star break being some area for momentum build. If Goldschmidt is set on going to free agency because he's earned it or because he wants to establish that market for others after seeing what's happened the past two years, that's when it gets interesting, because the Cardinals aren't just bidding against themselves at that point and against losing him completely, they're bidding against him taking a stand as a player. Comfort zone? Can we be candid here for a minute? 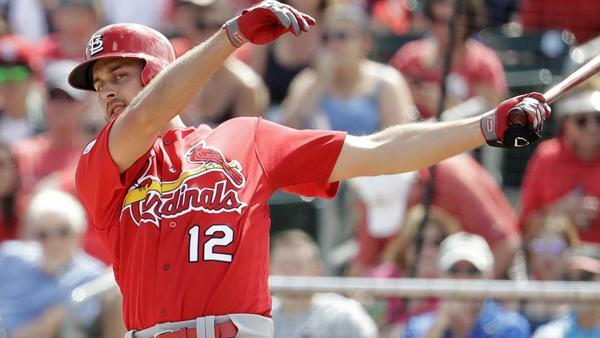 The Cardinals don't have a Paul Goldschmidt rising through the organization. They don't have a Paul Goldschmidt on the market to go get if he doesn't sign an extension. Oh, sure, they'll adjust. They'll say they'll adjust. But they have one of the five best hitters in the league and he's not going to be aiming for the decade deal that Pujols got -- so the comfort zone should adjust to do whatever is possible to make sure he doesn't leave. If he wants to be an Astro or a Yankee, then the Cardinals must confront why he doesn't want to be a Cardinal -- and that a different discussion then they aren't willing to meet his price. That shouldn't be an option. They can meet his asking price. Has the fifth starter spot in his grasp, for sure. Impressive spring. Doesn't it look like the Bret Cecil era with STL is over? Are they just delaying the inevitable? Has that feel, yes. Rick Hummel will have more on this shortly. He had a chance to talk to Brett Cecil today -- part of the many angles of news that group here has been covering today -- and will have details about Cecil's lack of feeling in his fingers and concerns about his forearm. For weeks you've spoken of a buoyant clubhouse that feels good about its chances this year. Have you seen that diminished at all lately with the offense struggling? Ball Robinson just hit is out at Busch along with probably everywhere but SF? Yep. The Dean -- where power goes to die. Would you rather write about a 2019 Cardinal World Series Championship or be a crew member on the set of an upcoming Marvel blockbuster? Oh, swell, another question that I just cannot win. I have no stake in the first one and no points on the backend of the other. I guess I'll go with the baseball game because Pete Finney, the longtime great sports columnist at The Times-Picayune, told me never to overlook a championship team on your beat. They happen rarely. So don't screw up covering one. I know what it would mean for the city and for the newspaper and I don't really have plans in October anyway. I keep it open. This is inspired by the great podcast you did with Richard Justice - as down as some local fans might be in the chats and on Twitter, do you get the sense that around the game and on a national level, other teams and writers are REALLY high on the Cardinals this season? It feels like there's a ton of buzz on their potential going into April. They are yes. Other teams, other scouts, other writers -- absolutely. It's been a weird dichotomy for the St. Louis-based writers this spring because there has been this negative swirl on Twitter, in chats, and in our inboxes, while outside that bubble from people around other teams and such there is definitely a sense that the Cardinals have some of the best pitching around and pitching is what makes a contender ... and on and on. I'm not sure how to solve that juxtaposition, only to say it gets uncomfortable caught in between it sometimes. How long will the team allow Fowler to try and figure his game out? If he is hitting sub .200 after a month will that be enought proof? Will it be less time? They don't have a date in mind. It won't be a litmus test based on his batting average. Derrick - Physicians are taught: "First, do no harm." Either Mo or Schildt should have told that to Jeff Francis, the new batting coach. This second string whiz from the Astros is determined to change the way the Cards hit, but so far the results are horrid. None of the regulars are hitting anywhere near their potential. Schildt whistles a happy "We've got a plan" tune, but with the season starting next week, it's idiotic to believe everybody will immediately be cured on opening day. Jeff Francis is a lefthanded pitcher who threw for the Rockies for awhile. Jeff Albert is the Cardinals new hitting coach. The Cardinals of 2018 were the first lineup in club history to strike out more often than they had hits. Seems to me some kind of change was necessary. Physicians are taught to cure the patient, too. Yikes on those Mikolas numbers, is there growing concern over his performance so far this spring? Not really. He didn't spot well with his fastball. Got batted around. Weird venue, too. Not all that great pitching on the back fields in front of a few fans. It's a curious setting the Cardinals sent these guys to this morning. Got my tickets to the Cards Brewers Game on Sat March 30th. Any idea who is going to pitch that game? Sets up to be Michael Wacha at this point, with Adam Wainwright as the other possibility. Wainwright is going to start in Memphis for the Cardinals, as of now. That would put him on line for Saturday, though he could start against a teammate and that would be Wacha. Flaherty is set to pitch the home opener at Busch. DG, I attended my first spring training game Saturday vs the Nats in West Palm Beach. After watching the game, I've now started giving spring training even less weight than before. The teams clearly are "working on things" more so than competing. Also the matchups just aren't anywhere near fair - one minute you have Scherzer vs the Cardinals AAA lineup, and the next its Hunter Cervenka (who?) against Wilmer Difo. What's even the utility of reporting these stats? Context to describe exactly what's happening -- what they're working on. For individual hitters you're talking about 30 or so at-bats. Not much when it comes to sample size. For teams as a whole you're talking a much larger group of numbers, a true data set, but so many of the leading ABs at this point are also players who aren't starting for the big-league team. The lineup the Cardinals expect has about 250 at-bats this spring. That's something to draw on -- but nothing that provides some great elemental truth unless you look deeper. I stand by the fact that the Cardinals high high flyouts and low low walks are worth noting. And that's not just because of the sample size -- it has to do with comparing them to other teams in spring. Fourteen more innings of fly outs than any other team in the division, that's noteworthy. How long are they gonna let Gyorko fake this injury to keep himself from being traded? Right. Yeah. Maybe March 2? Probably March 2. Seems like March 2 is a good answer. Got tickets to see the Cards play the Redbirds next week in Memphis. Any idea on if there will be additional activities before or after the game?